Oyaas: Restricting ability to sell-out potentially "a deal killer"
Rybak: Hennepin Theatre Trust "moving in the right direction"
The Hennepin hand-off (part two): "The political dance"
Later this month, the Minneapolis city council decides the fate of its three historic theaters. The decision will likely commit the city -- and metro-area theater patrons -- to a decades-long relationship with the entertainment conglomerate Clear Channel. Most city officials are on-record saying they do not intend to hand undue control or influence to the company. But right now that assurance has little to back it up. Minneapolis, Minn. — On a recent night, people hunched in overcoats shuffle off of frigid Hennepin Avenue, past a sidewalk sax player, and into the lobby of the Orpheum Theatre. The revival of "Sweet Charity" is being road-tested here, in the country's third-largest theater market, before attempting a debut on Broadway. At this moment, the future of the Orpheum -- along with the smaller State and Pantages theaters just up the street -- is on the negotiating table. Minneapolis city staff are working out a deal behind closed doors with Clear Channel and its local partners to run the theaters for the next 30 years. At the end, the city will turn over the deed to the theaters themselves. Clear Channel is not new to the theater scene here. Since 2000, the giant of commercial radio has also become a world leader in traveling Broadway shows and other live entertainment. The company website lists 100 venues around the country it either owns, operates, or exclusively programs. Clear Channel declined to discuss the Hennepin theaters issue with MPR, citing the need to respect the on-going negotiations. Papers proposing the deal to the city say only that Clear Channel will secure a 30-year "consulting agreement" under which the company will assist in booking the Broadway season. Two local entities -- a non-profit called the Hennepin Theatre Trust and a for-profit company called the Historic Theatre Group -- would actually manage the theaters and ensure accountability to the community. That looks fine on paper -- but it doesn't add up, says Minneapolis City Council Member Paul Zerby. "When you look for financial substance here, other than the theaters themselves, the only place you find it in this arrangement really is Clear Channel," Zerby says. "And it's been my experience that when you have the heavy financial burden, you generally exert a control that goes with that." In November, Zerby and four other council members called for more time to clarify Clear Channel's involvement and intentions. But a majority of seven voted to put aside other proposals and negotiate exclusively with the Clear Channel team. The results of those negotiations are expected March 19th. One council member who voted to move ahead, Scott Benson, says the council simply left some questions to be answered in negotiations. "I guess it was unclear at the time -- and remains unclear -- just how much interest, if any, Clear Channel will have in the Hennepin Theatre Trust, which is the nonprofit that will run the theaters," Benson says. "My understanding is that their interest would be small." Clear Channel stake big...and growing? Formally, Clear Channel may have no interest at all in the Hennepin Theatre Trust itself. That would be more comforting for some if the trust were an organization of any substance. According to nonprofit paperwork on file with the state, the Hennepin Theatre Trust is an organization with no full-time employees, no independent office space, and massive amounts of ticket revenue passing through it -- $13 million last year. 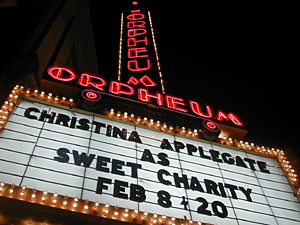 The nonprofit has faced accusations in the past of being little more than a tax shelter; in 2004, the proportion of the trust's revenues coming through individual donations was about five percent -- just enough to qualify for the state exemption on sales tax for theater tickets. While some on its 17-member board of trustees are known in the arts community, most are more notable for political connections in Minneapolis. The trust's president, Tom Hoch, declined to talk with MPR or provide any information about the trust's activities, also citing the current negotiations. Minneapolis Mayor R.T. Rybak, though, believes the trust can grow to fill a much bigger community role. That role includes -- in 2035 --owning the theaters. "I think what I want to be able to see is the capacity within the Hennepin theaters that we now see in the Walker or Guthrie or a (Minneapolis) Institute (of Arts) where they can weather good times or bad times, government involvement or lack of involvement, stand on their own and stand very strongly," Rybak says. "I think they have a ways to go, but they're moving in the right direction." Right now, the Hennepin Theater Trust would not exist without its for-profit partner, the Historic Theatre Group. The trust gets staff assistance and office space from HTG and -- in 2003 -- a $500,000 dollar loan to cover expenses. Under the deal being brokered with the city, it is the for-profit HTG that gets the contract to actually lease and manage the theaters. The company is owned by Minneapolis businessmen Fred Krohn, who declined to be interviewed until negotiations are complete, and Lee Lynch, who did not respond to an interview request. According to papers associated with the deal, Clear Channel also has a stake of undisclosed size in HTG. Additional investigation revealed the company has apparently been in talks to acquire more. MPR has confirmed from two independent sources that Clear Channel looked at acquiring the stake of at least one of the two local owners. In one case, a long-time figure in the Minnesota arts scene -- uninvolved with the Hennepin theaters issue -- relayed a personal conversation in 2003 with a Clear Channel employee who was involved in talks to buy out the share owned by Fred Krohn. Then, this past summer, Mark Oyaas overheard a conversation at city hall he probably was not meant to. Oyaas is a public affairs consultant in Minneapolis, who at the time was lobbying for a competing bid. "I was waiting for one of the principals from the Ordway, and coming down the hallway and into the cranny where I was sitting came a group from the Historic Theater Group," Oyaas says. A council committee had just passed an amendment placing some restrictions on ownership changes after the deal was done. Oyaas says it was clearly an unpleasant surprise. "The question they were asking themselves is, is this a deal killer -- is this amendment that was passed, is this a deal-killer for Clear Channel? It was clear to me there is concern that it reduces flexibility and makes the whole endeavor less lucrative," Oyaas says. Many say even these back-hallway details don't change the basic decision here: How to best assure quality entertainment in the Orpheum, State, and Pantages theaters -- and take the theaters, along with their debt, off the city's hands. The men behind the Hennepin Theatre Trust and Historic Theatre Group have been involved in some way with the theaters since 1991. In recent years, along with Clear Channel they have brought many strong shows to town, including "Aida," "The Producers" and the touring premier of "The Lion King." Council Member Paul Zerby has concerns about the group, but says he can't deny the track-record. "They've booked in good shows, people are comfortable working with them, the district up there has revivified under their leadership," Zerby says. "So I think anybody would say they haven't been doing a good job, as near as I can tell." Perhaps most important to the city of Minneapolis, Clear Channel has money. The company has offered to take on more than $20 million of debt the city incurred restoring the theaters -- and eat the substantial cost of converting those tax-exempt bonds to taxable ones. Clear Channel also guarantees lease payments and theater maintenance for the next 30 years, and would put another $1.5 million into theater renovations up-front. Council Member Scott Benson says the city wants out of the theater management business, and the Clear Channel team could assure that. "The more certain we are that there is somebody there that can guarantee any debt, in the end I think the better off Minneapolis taxpayers will be," Benson says. "It would have to be an entity -- maybe it wouldn't have to be as big as Clear Channel -- but an entity that has resources, and really neither of the other two had, shall we say, deep pockets." The "other two" bidders were the Ordway Center for the Performing Arts in St. Paul and a theater management company from Chicago called TheatreDreams, which later swung its support to the Ordway bid. Officials at the Ordway dispute they would have had any trouble financing their proposal, and say they could offer the city even more stability than Clear Channel -- a company with plenty of lawsuits beating down its door. Many council members and the mayor say they will go back to square one if the deal now being negotiated fails to keep Clear Channel at arm's length and assure local accountability. The council could take up the issue again before the end of the month.